A demanding excursion around one of the world's most iconic mountains and a testing progression for those who have completed the Tour du Mont Blanc. 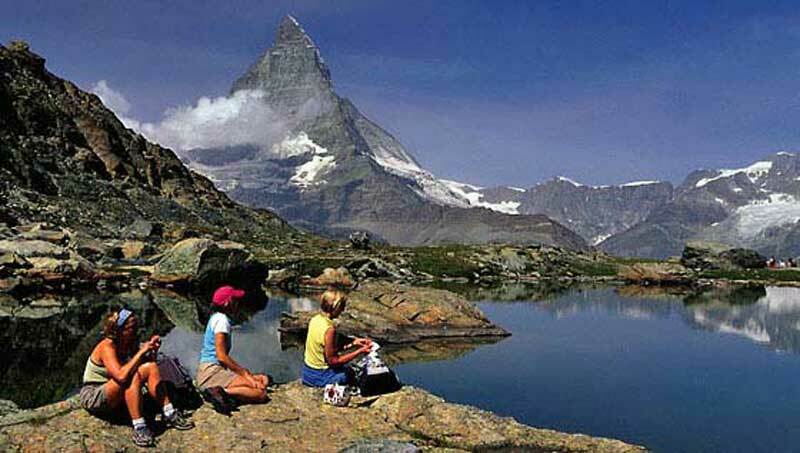 The Tour of the Matterhorn has been described as one of the most beautiful treks in the world and takes in many ancient trails that have linked the Swiss and Italian valleys for centuries. This trek has everything including beautiful alpine meadows, high passes, larch forests, balcony trails, glacial crossings, spectacular views of the Matterhorn (4478m) on all sides, as well as a further 25 peaks that are all over 4000 metres. Crossing high cols and frontiers that were once ancient trade routes used by porters, traders, soldiers, peasants, pilgrims and bandits, we pass through six valleys embracing three distinct cultures: Our journey will take you through the Germanic High Valais, the French speaking Central Valais and the Italian Val D'Aosta where life has changed little over the centuries. Glaciers and glaciated mountains are a major feature of the Tour of the Matterhorn which provide spectacular alpine views combined with diverse terrain as we traverse at high altitude crossing cols of over 3000m, where snow often remains well into June. Highlights include innumerable views of the Matterhorn from all angles, the Arolla Glacier, the Stellisee, a night in the spectacular surroundings of the Europa Hut and stunning alpine panoramas. However, the trek is tough and weather conditions can have a strong influence and it also requires glacial travel techniques for crossing some of the passes, and a good level of fitness is essential for this high altitude traverse. As a comparison this tour is considerably more demanding than the Tour du Mont Blanc and involves walking up to 7 hours per day with some extra long days and a one day section on glacial terrain from Arolla to the Prarayer Refuge that is classed as mountaineering which requires basic mountaineering equipment and is lead by an International Mountain Guide. This trip includes considerable ascent and descent and you will need to carry all of your own equipment, however, you will have access to your bags at Arolla where you will be able to change clothes and collect your mountaineering equipment that will be required on the technical leg across the Arolla Glacier. On this challenging walk you will receive expert guidance from our experienced Guide and have the opportunity to learn about essential mountaineering skills necessary for safe walking on glaciated terrain. The Tour of the Matterhorn is a progression for those who have done some Alpine trekking; however, at 145km the route is long and sustained and requires good stamina and fitness. These trips are scheduled upon demand and there are currently no dates planned for 2011. For latest availability and prices please contact us. If you have any questions about this activity please do not hesitate to ask.